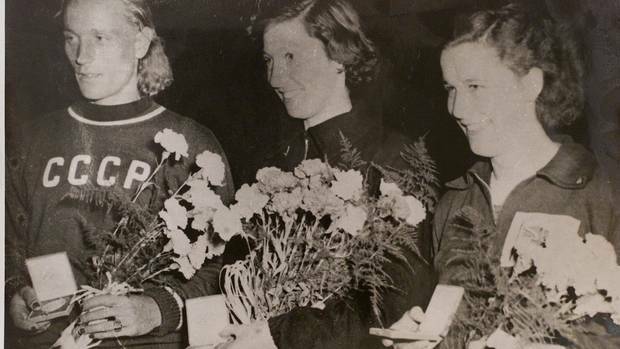 1952 Olympic gold medallist Yvette Williams has died aged 89. Williams, who became the first woman to win a gold medal for New Zealand when she won the women's long jump in Helsinki, died last night, TVNZ reported. She wrote her name into New Zealand's Olympic history books when she won a gold medal for long jump at the 1952 Helsinki games, becoming our first female Olympic champion. Williams' mark of 6.24m was also an Olympic record – and two years later she leaped a further 4cm to break the women's long jump world record. Helsinki Olympics, the Women's Long Jump Gold Medal Winner, New Zealand's Yvette Williams, center. Photo / Supplied. A natural athlete, the Dunedin-born sportswoman played netball and basketball before she was introduced to athletics. Her first national title was in shot put, before she turned her attention to long jump. In the lead up to the Helsinki Olympics, Williams was living in Auckland, where she would start her day with an hour of callisthenics before heading to work in the city as a secretary, where she would spend her lunch breaks training, running up and down the hills of central Auckland. After work, she would reportedly train for another three hours. Williams returned to Auckland after her Olympic win to a hero's welcome, with a homecoming tour that included a visit to Parliament House to meet the Prime Minister and a road trip back to her home in Dunedin. "As we headed through the South Island, lots of children and parents stood roadside waving flags and giving me bunches of flowers," Corlett told the Herald. "Finally we arrived in Dunedin, where they had organised an open-top car to drive down the main street lined in bunting. At the Town Hall, I dreaded making a speech. I preferred performing on the track and in the field." In 1956, Williams (now Yvonne Corlett after marrying her husband Buddy) retired from competition but continued to coach athletics and went on to actively work with Special Olympians. In 1990, she became one of the first people inducted into the New Zealand Sports Hall of Fame - officially recognised as one of New Zealand sport's original trailblazers.